August: Osage County is a film that teams up a host of fine actors/actresses who have worked with each other in the past and now meet again. It is based on a play (of the same name with the script being written by the actual playwright). The result is something that I expected. "August" is a completely dialogue driven vehicle that highlights a master class in performance compatibility (particularly by stars Meryl Streep and Julia Roberts). What's on screen is rooted in the extreme denouncement of dysfunctionality. The family featured and dissected, is so out of whack, they make the characters from say Mommie Dearest and Ordinary People to look like members of the Brady Bunch. A majority of these people are ones you dislike and they might force you to walk out of the theater while you try to put up with them. However, everyone is at the top of their game and needles to say, they all do superb work. "August" wants you to embrace its setting consisting of 100 degree plus heat, the underlying depression brought on by Eric Clapton's ditty, "Lay Down Sally" (I didn't think that was possible), and a sloppy narrative that still for some reason, keeps you tuned in to what exactly is going on. I'm recommending this film because of its ripe, teething script and the dialogue spoken with feverish glare by all the actors. Yeah, it's bleak stuff. But it's a showcase nonetheless. 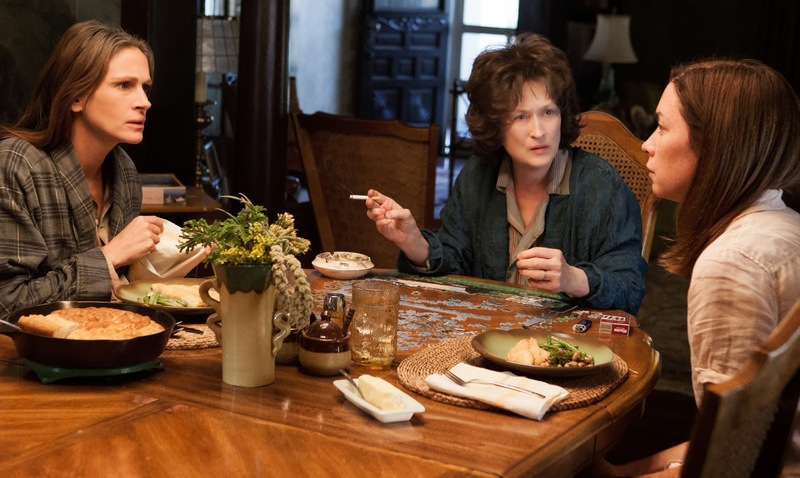 With Streep portraying a woman with mouth cancer (and who still likes to smoke about 2-3 packs a day) and Abigail Breslin taking in the scenery as a 14 year old who masquerades as a moderate pot smoker, August: Osage County brings together the Weston-Fordam-Aiken family for a sort of meeting to find Streep's missing husband (Beverly Weston played in a bit part by Sam Shepard). Once this alcoholic better half is found dead (by way of drowning), everyone gets together for the funeral all the while loading up on bickering and revealing of all flaws embedded in their immediate clan. Set in the Northern Oklahoma town of Pawhuska, this film escalates its scenes to the point where a ticking time bomb might go off. Meryl is intense and scary as Violet Weston. Although she seems to get award acclamation at the drop of a hat, this time her Academy Award nomination is well deserved. Julia Roberts as Barbara Weston-Fordam is equally intense as her resentful, Denver residing daughter who feigns at the notion that Violet is overdosing daily on all types of drug addicted medication. Then there's Robert's soft husband (Bill Fordam played by Ewan McGregor) who goes along for the ride but is separated from her. Her daughter is Jean Fordam (played by Abigail Breslin who is mentioned earlier) and her sisters are played by Juliette Lewis (Karen Weston) along with nearby resident Ivy Weston (Julianne Nicholson). 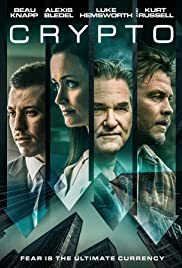 Rounding out the cast are acting heavyweights in the form of Chris Cooper, Dermot Mulroney, and Benedict Cumberbatch (the villain from Star Trek: Into Darkness). All the players with their angst-ridden personas, come up aces. The casting director for "August" really deserves their own perceptive enshrinement. As I said earlier though, "August" doesn't possess a happy ending nor does it clear anything up in terms of scaring and fortitude. You as the audience member, are pulled through the mud because of the naked, tragically enhanced portrayals by everyone involved. They talk down to each other, yearn for an argument between them, and ultimately bare their soul. This ensemble acting slightly reminded me of 1998's Hurlyburly, where star Sean Penn seemed to have collapsed a lung trying to get his hard earned thoughts out. When this exhausting thing runs its course and you figure everyone involved (in the movie, not in real life) should avoid each other for many years to come, its conclusion reveals an icky secret amongst the family members ultimately brought upon by the brain damaged character portrayed by Streep. She's the ultimate instigator here and you love and hate her equally because well, this woman is one heck of an actress. Ultimately, this is the type of film that you see if your depressed because what this family goes through might make you feel better about your own kin. On the other hand, if you're having a lousy day and feel down trout, you might be more subjected to viewing a flick with a little more uppity vibe. For what it's worth, August: Osage County is a fireball of majestic performances. Despite its flaws, it's just as good as "August" and everything after (no pun intended on The Counting Crows 1993 album release).